Arthur Millican Jr. is a former Disney artisan now relocated to the small community of Blairsville, in the beautiful North Georgia Blue Ridge Mountains. His working experiences include years at Disney as an artist and model maker, and later consulting and design services for Dollywood, Michael Jackson's Neverland Ranch and many other commercial parks and real estate developments world-wide. 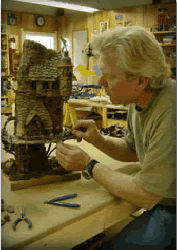 His passion is designing and producing whimsical and enchanting fairy houses, fairy doors and related items. From his new 2,500 sq. ft. woodworking studio, he creates hand crank toys called Automata and captivating fairy houses from birdhouses to large garden shed or children's playroom sizes. No two pieces are the same; Art gleans materials from festivals, resale shops garage sales and the like, then uses this material in the design. A bottle cap make make a hat for a gremlin or other figurine, a large old teapot just might turn into a fairy house, complete with front door, porch, windows and whatever else Art's imagination can come up with. His playhouses have also been highlighted in the 2nd season of HGTV's My Yard Goes Disney (both episodes 1 and 11). Art is the owner and operator of a small family business , Sleepy Hollow Enterprises, where he stays quite busy making a wonderful world of whimsy for young and young at heart. 5279 hwy 515 East Blairsville, GA 30512.